CTLA-4 is an inhibitory molecule that regulates T cell expansion and differentiation. CTLA-4 binding to B7-1/B7-2 is believed to be crucial for its inhibitory signal both by competing for CD28 binding to the same ligands and aggregating CTLA-4 to deliver negative signals. In this study, we demonstrate that B7 binding is not essential for CTLA-4 activity. CTLA-4 knockout T cells are hyperresponsive compared with wild-type T cells in B7-free settings. Expression of a B7-nonbinding CTLA-4 mutant inhibited T cell proliferation, cytokine production, and TCR-mediated ERK activation in otherwise CTLA-4-deficient T cells. Finally, transgenic expression of the ligand-nonbinding CTLA-4 mutant delayed the lethal lymphoproliferation observed in CTLA-4-deficient mice. These results suggest that ligand binding is not essential for the CTLA-4 function and supports an essential role for CTLA-4 signaling during T cell activation. Cytotoxic T lymphocyte Ag 4 plays a fundamental role in controlling T cell reactivity to autoantigens (1). In vitro, CTLA-4 ligation in the context of T cell activation blocks cytokine production and cell cycle progression (2, 3). In vivo, treatment of mice with anti-CTLA-4 mAb augments immunity and exacerbates autoimmunity in multiple models (4, 5, 6). Most significantly, genetically engineered CTLA-4 knockout (KO)3 mice succumb from hyper-lymphoproliferative disease, dying generally within 2–5 wk of age (7, 8). Several models have been proposed to explain the functional basis of CTLA-4 inhibition. The ligand competition model proposes that the high-affinity CTLA-4 molecule competes with CD28 costimulatory signals (9, 10). In another model, CTLA-4 has been proposed to deliver distinct distal signals independent of the TCR signal to attenuate T cell responses (11). Finally, CTLA-4 has been proposed to induce IDO, which catalyzes the conversion of tryptophan to kynurenine, which in turn inhibits T cell activation (12). In all of these models, the negative regulatory function of CTLA-4 requires interactions with the ligands B7-1 (CD80) and/or B7-2 (CD86). Over the past few years, we and others have proposed that CTLA-4 may function at a very proximal stage of TCR signaling when the TCR complex forms an immunological synapse (IS) (13, 14, 15). Lipid raft-associated CTLA-4 interacted intimately with the TCR complex and altered lipid raft integrity and TCR-mediated signals (13). The association occurred subsequent to TCR signaling and was not dependent on B7 ligation (13). Finally, it has been shown recently that susceptibility in NOD mice is linked to a truncated form of CTLA-4, ligand-independent CTLA-4 (liCTLA-4), that does not express an extracellular domain (16). Vijayakrishnan et al. (17) showed that overexpression of liCTLA-4 inhibited T cell activation in vitro. These results suggest that CTLA-4 might function independent of B7 ligation as a consequence of recruitment to the synapse on activated T cells. In this study, we use a point-mutated full-length CTLA-4 molecule that completely lacks B7 binding capability. The results provide direct evidence that CTLA-4 can function in the absence of B7 binding, suppressing T cell activation and the uncontrolled hyperproliferation in CTLA-4 KO mice. Hamster anti-mouse CD3ε (145-2C11), anti-CD28 (PV-1), anti-B7-1(16-10A1), and anti B7-2 (GL-1) were prepared in our lab. The anti-CD3-fos × anti-CD4-jun bispecific mAb was provided by Dr. J. Tso (Protein Design Labs, Fremont, CA) (18). The rabbit anti-CTLA-4 C-terminal epitope was a gift from Dr. T. Uede (Hokkaido University, Hokkaido, Japan) (19). The Ab pairs used for IL-2 and IFN-γ ELISA (BD Pharmingen) were used according to manufacturer’s recommended protocols. Recombinant mouse B7-1Ig fusion protein (R&D Systems) incubated with protein A-coupled Alexa 633 (Molecular Probes) was used for FACS. Anti-phospho (Thr202/Tyr204)-Erk and anti-Erk mAbs were from Cell Signaling Technology. BALB/c mice were purchased from Charles River Laboratories. DO.11 TCR transgenic (Tg) Rag-2 KO CTLA-4 KO mice as well as BALB/c B7-1/B7-2 double KO (DKO) were kept in specific pathogen-free conditions in the UCSF Animal Barrier Facility. cDNA constructs of wild-type and mutant CTLA-4 were subcloned into a murine retroviral vector LXIE (a gift from Dr. H. Spits, University Hospital Free University, Amsterdam, The Netherlands) upstream of enhanced GFP (eGFP) (20). The cDNA encoding CTLA-4 and mutant was separated from eGFP by an internal ribosomal entry site. This allowed for simultaneous expression of each protein based on the bicistronic mRNA. The purified CD4+ T cells were activated using irradiated BALB/c mice splenocytes and OVA-derived peptide (aa 323–339) (1 μg/ml). One day later, retroviral DNA-transfected Phoenix cells (from Dr. G. Nolan, Stanford University, Stanford, CA) were added to each well after treatment with 50 μg/ml mitomycin C. At day 3, transduced cells were sorted based on anti-CD4-allophycocyanin staining and eGFP fluorescence using MoFlo cell sorter. The sorted cells were restimulated by irradiated BALB/c splenocytes and OVA peptide. Thymidine incorporation was measured between 16 and 24 h following Ag restimulation. Supernatants were pooled at 16 h for cytokine assay. The cDNA for mutant PYAA CTLA-4 was subcloned into pUHG-10 vector using XbaI restriction site (21). The 2800-bp fragment containing tetracycline O, the CMV minimal promoter, and the cDNA insert was excised using XhoI and AseI site and microinjected into day 1 embryos isolated from FVB/n mice. Tg founders were crossed to EμSRα-tTA mice on the same background for specific transgene expression on T cells (21). The primers used to screen both transgenes were as follows: tetO PYAA, forward, 5′-gtccagtaggcgtgtacg-3′; tetO PYAA, reverse, 5′-acaaaaggccaagtcctagaa-3′; tTA, forward, 5′-gctgcttaatgaggtcgg-3′; and tTA, reverse, 5′-ctctgcaccttggtgatc-3′. Tg mice were fed a mouse diet containing doxycycline (200 mg/kg food; Bioserv) to turn off the tet-regulated transgene. The importance of B7 ligation for CTLA-4 function was assessed using DO.11 TCR Tg mice bred onto a Rag-deficient background to eliminate the spontaneous activation of T cells observed in CTLA-4-deficient mice. The DO.11 TCR mice survived long term and exhibited no uncontrolled hyperproliferation. DO.11 Tg WT and CTLA-4 KO T cells responded similarly to OVA peptide-pulsed irradiated H-2d B7 DKO spleen cells in a primary stimulation assay based on proliferation and up-regulation of the activation markers CD25, CD44, and CD69 (data not shown), as well as robust IL-2 production in the presence of anti-CD28 costimulation (Fig. 1⇓A). However, the CTLA-4 KO DO.11 Tg T cells responded better than wild-type Tg T cells to B7 DKO OVA-pulsed APC in a secondary response when stimulated with B7-deficient OVA-pulsed APC. The CTLA-4 KO DO.11 T cells proliferated more (data not shown) and produced significantly more IL-2 compared with WT preprimed cells (Fig. 1⇓B). By comparison, pharmacologic activation of PKC and calcium pathways by PMA and ionomycin activated WT and KO cells similarly consistent with our observations, showing that CTLA-4 functions in the early stages of TCR signaling (22). Anti-B7-1 and anti-B7-2 Abs were added during the entire experimental course to block possible effect of B7-1 or B7-2 expression on the activated T cells. These results suggested that the presence of CTLA-4 on T cells increased the threshold for activation in a B7-independent manner. CTLA-4 KO cells produce more IL-2 in a secondary stimulation by B7-deficient APCs. A, CD4+ T cells from DO.11 Rag-2 KO mice (WT) and DO.11 Rag-2 KO CTLA-4 KO mice (KO) were stimulated with syngeneic B7-1/B7-2 DKO splenocytes and OVA peptide. Anti-CD28 mAb (0.2 μg/ml) was added to the culture to provide costimulation. IL-2 in culture supernatant was measured 16 h after stimulation. B, WT and KO cells were primed by B7 DKO APC and OVA peptide (1 μg/ml) in the presence of anti-CD28 (0.2 μg/ml), anti-B7-1 (5 μg/ml), and anti-B7-2 (5 μg/ml). Live cells were enriched by Ficoll density gradient after 72 h of culture, washed, and stimulated by B7 DKO APC and OVA peptide in the presence of anti-B7-1 (5 μg/ml) and anti-B7-2 (5 μg/ml) mAbs. IL-2 protein was measured at 16 h after restimulation by ELISA. A hexapeptide motif (MYPPPY) present in the CDR3-like domain of CTLA-4 is critical for binding to both B7-1 and B7-2 (23). Therefore, we mutated the proline and tyrosine at positions 5 and 6, respectively, to alanine to create a B7-nonbinding mutant form of CTLA-4. A full-length CTLA-4 MYPPAA mutant form (PYAA mutant), overexpressed in Phoenix cells, did not bind to either recombinant B7-1Ig fusion protein (Fig. 2⇓A) or B7-2Ig (data not shown). This was in sharp contrast to the wild-type CTLA-4 molecule, which bound B7-1Ig at high levels correlating with GFP expression. The lack of B7-1 binding to PYAA mutant was not due to reduced transfection efficiency because internal ribosomal entry site-regulated eGFP expression in the retrovirus construct was comparable between WT and PYAA transfectants (Fig. 2⇓A, middle and right panels). Furthermore, an equal amount of protein was immunoprecipitated from WT and PYAA transfectants by anti-CTLA-4 C-terminal mAb (Fig. 2⇓B). A ligand-nonbinding mutant CTLA-4 can inhibit T cell activation in vitro. A, Phoenix cells were transfected with retrovirus vectors encoding WT CTLA-4 or a PYAA mutant molecule. Cells were subsequently analyzed by flow cytometry based on eGFP expression and Alexa 633-coupled B7-1 Ig fusion protein binding. The percentage of B7-1Ig-bound cells is represented in the upper right quadrant. B, The cell lysates were immunoprecipitated (IP) using an extracellular-specific anti-CTLA-4 mAb (UC10-4F10; left three lanes) or an anti-C-terminal CTLA-4 mAb. The IPs were Western blotted (WB) using the anti-C-terminal mAb. C, DO.11 Rag-2 KO CTLA-4 KO T cells were transduced with empty vector, WT or PYAA mutant CTLA-4-encoding vector. Sorted GFP-positive cells were permeabilized and stained using an anti-C-terminal mAb and analyzed by FACS. The staining of empty vector transfectants is shown as a filled histogram. D and E, The transfected cells were stimulated by various concentrations of OVA peptide and syngeneic splenocytes. Proliferation was assessed by [3H]thymidine incorporation between 12 and 18 h (D), and IFN-γ production was measured at 12 h by ELISA (E). In vitro-activated DO.11 Rag-2 KO CTLA-4 KO T cells were infected with the CTLA-4 WT and PYAA mutant CTLA-4 and sorted based on eGFP expression. The sorted eGFP+ cells expressed CTLA-4 based on FACS staining using the intracellular domain-specific mAb (Fig. 2⇑C). The sorted eGFP+ cells were restimulated using OVA peptide and syngeneic APC. 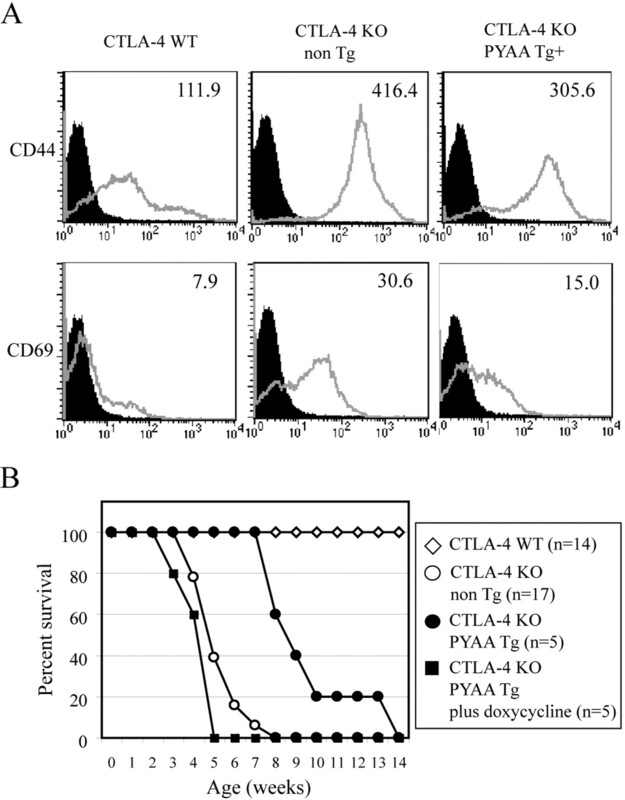 T cells reconstituted with PYAA mutant CTLA-4 inhibited both proliferation and cytokine production compared with empty vector transfectants (Fig. 2⇑, D and E). The inhibition of secondary activation was observed in multiple experiments at all peptide concentrations tested. However, the expression of the B7-binding wild-type molecule was more efficient in blocking T cell activation. Because similar intracellular distribution of the WT and PYAA mutant molecules were observed in the two transfected cell populations (Fig. 2⇑C), it is likely that the migration of CTLA-4 to the cell surface upon TCR stimulation was similar. Thus, the results suggest that binding of CTLA-4 to B7, although not essential, enhances the regulatory activity of the CTLA-4 molecule by stabilizing CTLA-4 within the IS. To study the ligand-independent function of CTLA-4 in a physiological setting, we generated Tg mice that expressed the PYAA mutant transgene in T lineage cells under the control of a tetracycline-responsive minimal promoter (tet-o-PYAA) (Fig. 3⇓A). Selected founder mice were bred with a second Tg line that expressed the tTA under the control the Ig H chain enhancer and the SRα promoter (EμSR-tTA) (21) (Fig. 3⇓A). Assessment of CTLA-4 expression on freshly isolated lymph node cells using the C-terminal epitope-specific mAb in Western blot analyses demonstrated significant amounts of transgene protein in Tg+ but not Tg− littermate T cells (Fig. 3⇓B). The Tg protein was specifically expressed on thymocytes (data not shown) and peripheral lymph node T cells (Fig. 3⇓C), but not B cells (data not shown). Furthermore, the expression of the transgene was highly regulated by the tetracycline promoter because feeding mice with doxycycline-containing diet for 1 wk turned off transgene expression (Fig. 3⇓C, right panels). Unless noted, phenotypic and functional studies were performed in the absence of doxycycline to ensure maximal CTLA-4 expression in this tet-off system. Expression of the PYAA mutant transgene inhibits T cell activation in vitro. A, Schematic structures of the constructs used to create Tg mice is depicted. B, Lymph node cells were isolated from either PYAA Tg-positive mice or non-Tg controls. The cell lysates were immunoprecipitated and immunoblotted with an anti-C-terminal CTLA-4 mAb. The band corresponding to Ig H chain is indicated. C, Lymph node cells from Tg-negative, PYAA Tg-positive, and PYAA Tg-positive mice fed with doxycycline chow for 1 wk were permeabilized and immunostained with C-terminal-specific CTLA-4 antisera plus PE-conjugated anti-rabbit Ig. CTLA-4 expression is shown on cells gated on CD4 or CD8. D, Freshly isolated CD4-positive lymph node cells were stimulated by anti-CD3ε mAb and irradiated syngeneic spleen cells. [3H]Thymidine incorporation was measured between 84 and 92 h in culture period. E, Four million freshly purified CD4-positive lymphocytes from PYAA Tg-negative and PYAA Tg-positive mice were stimulated by anti-CD3-fos × anti-CD4-jun construct for 5 min. The cell lysates were analyzed by Western blot using phospho-ERK mAb (upper panel). The membrane was stripped and reprobed with whole ERK mAb. Initial functional studies were performed by comparing non-Tg and Tg littermate T cells in a T cell proliferation assay where both the T cell populations were bred onto the CTLA-4-sufficient background to avoid the hyperproliferative syndrome. T cells from PYAA Tg mice proliferated significantly less than T cells from Tg negative littermates (Fig. 3⇑D). We examined next the phosphorylation of ERK, a major downstream target of CTLA-4 inhibition (11) in non-Tg vs Tg T cells upon stimulation with a bispecific anti-CD3 × anti-CD4 mAb. The presence of the PYAA mutant CTLA-4 molecule significantly inhibited ERK phosphorylation when compared with non-Tg littermate T cells (Fig. 3⇑E), even though both T cell populations expressed equal amounts of both ERK1 and ERK2. The inhibitory effects of PYAA mutant CTLA-4 expression on T cell proliferation and ERK activation were not due to global defects in signaling, because T cells from the Tg mice responded equally well to a combination of PMA and ionomycin (Fig. 3⇑, D and E). The PYAA mutant transgene was bred into mice homozygous for the CTLA-4-null mutation. CTLA-4 KO mice with either the single tet-off PYAA transgene or the EμSR-tTA transgene did not express the PYAA protein and were used as controls. In contrast, experimental CTLA-4 KO animals carrying both transgenes expressed PYAA mutant molecules on T cells in both the thymus and periphery (data not shown). CTLA-4 KO mice experienced severe lymphoadenopathy, enlarged lymph nodes, an increased number of T lymphocytes, and marked up-regulation of CD69 and CD44 on T cells at 3 wk of age (Fig. 4⇓A, upper and lower middle panels, and data not shown). In contrast, littermate KO mice expressing the PYAA transgene showed 6-fold fewer lymphocytes and reduced expression of activation markers, suggesting that the PYAA transgene delayed the lymphocyte activation in KO mice (Fig. 4⇓A, right panels, and data not shown). Transgene-negative KO mice died with a mean survival of 4.53 wk. In contrast, PYAA Tg mice had a mean survival of 8.8 wk with some mice living up to 13 wk of age (p = 0.001) (Fig. 4⇓B). To further prove that the increased survival was due to the expression of the PYAA CTLA-4 mutant transgene, mice treated from birth with doxycycline to turn off PYAA CTLA-4 expression died with kinetics identical with straight CTLA-4 KO mice. Expression of PYAA mutant transgene delays lethal lymphoproliferation in CTLA-4 KO mice. A, PYAA mutant CTLA-4 Tg mice were bred into the CTLA-4 KO background. CD4-positive lymph node cells from 3-wk-old littermates were analyzed for CD69 and CD44 expression. B, Survival curve of WT (n = 14; ⋄), PYAA mutant Tg-positive (n = 5; •) and -negative CTLA-4 KO (n = 17; ○) mice is shown. In addition, PYAA Tg-positive CTLA-4 KO mice fed with doxycycline chow during gestation and after birth (n = 5; ▪) were compared. The present studies show that expression of a B7 ligand-nonbinding CTLA-4 molecule inhibited the in vitro response of CTLA-4 KO T cells, and protected mice from the massive hyperproliferation and tissue infiltration observed in CTLA-4-deficient animals. However, the PYAA mutant CTLA-4 transgene failed to fully rescue the lymphoproliferative disease. This may be due to the fact that the PYAA transgene expression was high on thymocytes but diminished on peripheral T cells, especially activated T cells in all founder strains. This effect was due to weaker transcriptional activity of the Eμ promoter in this setting. Alternatively, the partial effect may be due to important ligand-dependent functions of the CTLA-4 molecule. In this regard, we and others have shown that CTLA-4 is colocalized in the IS of activated T cells (13, 14, 15) where it inhibits TCR ζ phosphorylation, the most proximal event of T cell activation (22). Interestingly, this ζ dephosphorylation is apparent only when CTLA-4 is coligated with TCR (Refs. 22 and 24 , and S. Chikuma and J. Bluestone, unpublished observation). We speculate that expression of the ligand-independent form of CTLA-4 inhibits ERK, but TCR dephosphorylation is B7 dependent, because this interaction is required for stabilization of CTLA-4 in the IS. It has been speculated that the high-affinity interaction between B7 and CTLA-4 is the primary mechanism by which CTLA-4 maintains immune homeostasis. The basis of this is the documented effects of CTLA-4 in competing with CD28 for B7 binding (9, 10) and the delivery of a signal through B7 into dendritic cells, which results in the induction of IDO (12). In this regard, it should be noted that two publications demonstrated that the expression of a mutant CTLA-4 molecule without functional intracellular domain blocked CTLA-4 KO hyperproliferative disease completely (25), or partially (9) depending on the surface expression level, presumably as a consequence of competition for CD28/B7 ligation or IDO induction. Our results demonstrate clearly that CTLA-4 does not need to bind B7 to inhibit T cell activation. However, taken together, the results suggest that inhibitory signals are transduced via both ligand-independent and B7 ligation-dependent mechanisms to maximize negative signaling. The biological significance of these observations has been illustrated in recent genetic analysis of the mouse ctla4 gene, which identified an alternatively spliced form of the molecule that encoded a protein completely lacking extracellular domain (liCTLA-4) (16, 17). In fact, a single nucleotide mutation that inhibits the alternative splicing has been mapped as the critical polymorphism in the NOD mouse IDD5 locus in autoimmune diabetes-prone NOD mouse strain, which might help to explain the autoimmune propensity of this inbred strain of mice (16). Importantly, the naturally occurring liCTLA-4 is expressed in naive T cells rather than activated T cells and the truncated molecule effectively inhibited activation in vitro (17). Thus, we propose that the liCTLA-4 form has distinct temporal expression and biological functions compared with full-length CTLA-4. The late expression of the full-length form of CTLA-4 is consistent with a critical role in attenuating ongoing Ag-driven immune responses and maintaining tolerance. In this regard, we and others have demonstrated that blockade of full-length CTLA-4 engagement with B7 can reverse tolerance and that direct engagement of CTLA-4 using mAbs directed at the extracellular domain can attenuate responses (4, 5, 24). In fact, treatment of autoimmune mice with an anti-CTLA-4 mAb directed at the full-length B7 ligand binding form exacerbates immunity only after the disease has been initiated—not when administered at birth (5). Similarly, anti-CTLA-4 therapy in the tumor setting enhances immunity by up-regulating Ag-specific immunity (26). In contrast, the function of li form has not been understood. It is tempting to speculate that this isoform controls survival and/or homeostasis of naive T cell subsets based on the observation that the liCTLA-4 form is expressed in naive T cells and the CTLA-4 KO mouse (which eliminates both forms) manifests a lymphoproliferative disease that occurs in a potentially Ag-independent manner. The expression of liCTLA-4 might set a higher threshold of TCR signaling that keeps autoproliferation as well as homeostatic proliferation in the young “lymphopenic” mice in check. Both ligand-dependent and -independent function of CTLA-4 should be further examined in the future study for understanding the clinical importance of CTLA-4 manipulation in autoimmunity. We thank Jason Dietrich for Tg injection; Paul Wegfahrt, Yousuf Bhaijee, and Mike Lee for expert assistance with the mice; and Shuwei Jiang for cell sorting. We thank Dr. Mark Anderson for critical reading of the manuscript, Dr. T. Uede for anti-CTLA-4 Ab, Dr. H. Spits for LIIE vector, Dr. Gary Nolan for Phoenix cells, Dr. Michel Bishop for pUHG vector, and Dr. J. Tso for anti-CD3/CD4-bispecific Ab. We also thank Drs. Nigel Killen, Yosef Refaeli, and members of the Bluestone laboratory for helpful discussions. ↵1 This work was supported by National Institutes of Health Grants P01 AI35297 and P30 DK63720. ↵3 Abbreviations used in this paper: KO, knockout; DKO, double KO; IS, immunological synapse; Tg, transgenic; eGFP, enhanced GFP; liCTLA-4, ligand-indepent CTLA-4. Chikuma, S., J. A. Bluestone. 2003. CTLA-4 and tolerance: the biochemical point of view. Immunol. Res. 28: 241-253. Krummel, M. F., J. P. Allison. 1996. CTLA-4 engagement inhibits IL-2 accumulation and cell cycle progression upon activation of resting T cells. J. Exp. Med. 183: 2533-2540. Walunas, T. L., D. J. Lenschow, C. Y. Bakker, P. S. Linsley, G. J. Freeman, J. M. Green, C. B. Thompson, J. A. Bluestone. 1994. CTLA-4 can function as a negative regulator of T cell activation. Immunity 1: 405-413. Eagar, T. N., N. J. Karandikar, J. A. Bluestone, S. D. Miller. 2002. The role of CTLA-4 in induction and maintenance of peripheral T cell tolerance. Eur. J. Immunol. 32: 972-981. Luhder, F., C. Chambers, J. P. Allison, C. Benoist, D. Mathis. 2000. Pinpointing when T cell costimulatory receptor CTLA-4 must be engaged to dampen diabetogenic T cells. Proc. Natl. Acad. Sci. USA 97: 12204-12209. Karandikar, N. J., C. L. Vanderlugt, T. L. Walunas, S. D. Miller, J. A. Bluestone. 1996. CTLA-4: a negative regulator of autoimmune disease. J. Exp. Med. 184: 783-788. Riley, J. L., C. H. June. 2005. The CD28 family: a T-cell rheostat for therapeutic control of T-cell activation. Blood 105: 13-21. Calvo, C. R., D. Amsen, A. M. Kruisbeek. 1997. Cytotoxic T lymphocyte antigen 4 (CTLA-4) interferes with extracellular signal-regulated kinase (ERK) and Jun NH2-terminal kinase (JNK) activation, but does not affect phosphorylation of T cell receptor ζ and ZAP70. J. Exp. Med. 186: 1645-1653. Chikuma, S., J. B. Imboden, J. A. Bluestone. 2003. Negative regulation of T cell receptor-lipid raft interaction by cytotoxic T lymphocyte-associated antigen 4. J. Exp. Med. 197: 129-135. Egen, J. G., J. P. Allison. 2002. Cytotoxic T lymphocyte antigen-4 accumulation in the immunological synapse is regulated by TCR signal strength. Immunity 16: 23-35. Darlington, P. J., M. L. Baroja, T. A. Chau, E. Siu, V. Ling, B. M. Carreno, J. Madrenas. 2002. Surface cytotoxic T lymphocyte-associated antigen 4 partitions within lipid rafts and relocates to the immunological synapse under conditions of inhibition of T cell activation. J. Exp. Med. 195: 1337-1347. Smith, J. A., J. Y. Tso, M. R. Clark, M. S. Cole, J. A. Bluestone. 1997. Nonmitogenic anti-CD3 monoclonal antibodies deliver a partial T cell receptor signal and induce clonal anergy. J. Exp. Med. 185: 1413-1422. Chikuma, S., M. Murakami, K. Tanaka, T. Uede. 2000. Janus kinase 2 is associated with a box 1-like motif and phosphorylates a critical tyrosine residue in the cytoplasmic region of cytotoxic T lymphocyte associated molecule-4. J. Cell. Biochem. 78: 241-250. Heemskerk, M. H., B. Blom, G. Nolan, A. P. Stegmann, A. Q. Bakker, K. Weijer, P. C. Res, H. Spits. 1997. Inhibition of T cell and promotion of natural killer cell development by the dominant negative helix loop helix factor Id3. J. Exp. Med. 186: 1597-1602. Felsher, D. W., J. M. Bishop. 1999. Reversible tumorigenesis by MYC in hematopoietic lineages. Mol. Cell 4: 199-207. Lee, K. M., E. Chuang, M. Griffin, R. Khattri, D. K. Hong, W. Zhang, D. Straus, L. E. Samelson, C. B. Thompson, J. A. Bluestone. 1998. Molecular basis of T cell inactivation by CTLA-4. Science 282: 2263-2266. Peach, R. J., J. Bajorath, W. Brady, G. Leytze, J. Greene, J. Naemura, P. S. Linsley. 1994. Complementarity determining region 1 (CDR1)- and CDR3-analogous regions in CTLA-4 and CD28 determine the binding to B7-1. J. Exp. Med. 180: 2049-2058. Griffin, M. D., D. K. Hong, P. O. Holman, K. M. Lee, M. J. Whitters, S. M. O’Herrin, F. Fallarino, M. Collins, D. M. Segal, T. F. Gajewski, et al 2000. Blockade of T cell activation using a surface-linked single-chain antibody to CTLA-4 (CD152). J. Immunol. 164: 4433-4442. Takahashi, S., H. Kataoka, S. Hara, T. Yokosuka, K. Takase, S. Yamasaki, W. Kobayashi, Y. Saito, T. Saito. 2005. In vivo overexpression of CTLA-4 suppresses lymphoproliferative diseases and thymic negative selection. Eur. J. Immunol. 35: 399-407. Leach, D. R., M. F. Krummel, J. P. Allison. 1996. Enhancement of antitumor immunity by CTLA-4 blockade. Science 271: 1734-1736.